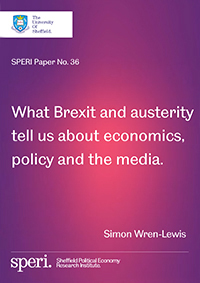 We are delighted to publish the transcript of Simon Wren-Lewis’s Prize-winning Lecture: What Brexit and austerity tell us about economics, policy and the media. In this Paper, Simon Wren-Lewis tackles the inconsistencies and inaccuracies reported in the media about austerity and Brexit. He calls for journalists to bring in academic expertise and to prick the Westminster bubble. Simon Wren-Lewis is Professor of Economic Policy at the Blavatnik School of Government, Oxford University. He is the author of a lively, frequently updated and widely read blog, Mainly Macro, and the winner of the 2016 New Statesman/SPERI Prize for Political Economy. His talk can be watched on the SPERI youtube channel. Download SPERI Paper No. 36: What Brexit and austerity tells us about economics, policy and the media.